With a stay at Leticia's Garden Resort and Events Place in Calumpit, you'll be 29.9 mi (48.1 km) from Smart Araneta Coliseum and 30.7 mi (49.4 km) from San Agustin Church. The front desk is staffed during limited hours. Free self parking is available onsite. With a stay at Halina Drive Inn Hotel - Pasay in Pasay, you'll be within a 15-minute drive of SM Mall of Asia and Department of Foreign Affairs. Free self parking is available onsite. With a stay at Shorebreak Boracay Resort in Boracay Island, you'll be within a 15-minute walk of Boat Station 2 and Boat Station 1. The front desk is staffed during limited hours. 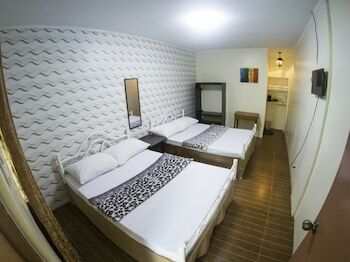 When you stay at AEROSTOP HOTEL & RESTAURANT in Plaridel, you'll be 5.6 mi (9.1 km) from Malolos Cathedral. The front desk is staffed during limited hours. Free self parking is available onsite.